THE B-MOVIE NEWS VAULT: Lionsgate's Vestron label opens THE GATE on February 28th! Lionsgate's Vestron label opens THE GATE on February 28th! 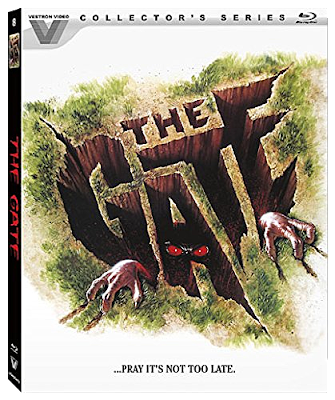 LIONSGATE'S VESTRON COLLECTOR'S SERIES GIVES TIBOR TAKACS' CLASSIC "THE GATE," THE ROYAL TREATMENT ON BLU-RAY! I unabashedly love THE GATE. Growing up, it was one of my favorite Horror movies (probably because it involved kids fighting against a supernatural evil), and I'm amazed at how well the film's effects still hold up. So you can imagine how excited I was when this film was announced as part of the Vestron Collector's Series! Now, within days I will be able to enjoy this film in high-definition, with hours of extras covering every facet of its production! JOY! Synopsis: When best friends Glen (Stephen Dorff) and Terry (Louis Tripp) stumble across a mysterious crystalline rock in Glen's backyard, they quickly dig up the newly sodden lawn searching for more precious stones. Instead, they unearth THE GATE — an underground chamber of terrifying demonic evil. The youngsters soon understand what forces they've unleashed, as they are overcome with an assortment of horrific experiences. With fiendish followers invading suburbia, it's now up to the kids to discover the secret that can lock The Gate forever . . . if it's not already too late! Audio Commentary with Director Tibor Takacs, Writer Michael Nankin, and Special Effects Designer & Supervisor Randall William Cook! Audio Commentary with Special Effects Designer & Supervisor Randall William Cook, Special Make-up Effects Artist Craig Reardon, Special Effects Artist Frank Carere, and Matte Photographer Bill Taylor! Isolated Score Selections and Audio Interview with Composers Michael Hoenig and J. Peter Robinson. THE GATE: Unlocked – A Conversation between Director Tibor Takacs and Special Effects Designer & Supervisor Randall William Cook. Minion Maker – An interview with Special Make-up Effects Artist Craig Reardon. From Hell It Came – An Interview with Co-Producer Andras Hamori. The Workman Speaks! – An Interview with Actor Carl Kraines. Made In Canada – A series of interviews with many of the local Toronto-based cast & crew including Production Manager Robert Wertheimer, Costume Designer Trysha Bakker, Third Assistant Director Kathleen Meade, 'Minion' Performer Jonathan Llyr, Actor Scot Denton, and Post-Production Supervisor H. Gordon Woodside. From Hell: The Creatures & Demons of THE GATE with Randall William Cook and Craig Reardon. The Gatekeepers with Tibor Takacs and Michael Nankin. If you're a fan of THE GATE, and you already own the previous DVD release from Lionsgate, I think it's safe to say that you can part with it and upgrade to this release! The cover art is better, the film has been remastered, and there are more special features than ever before! THE GATE comes out on Tuesday, February 28th and is available to buy at AMAZON, BULLMOOSE, and DIABOLIK DVD! 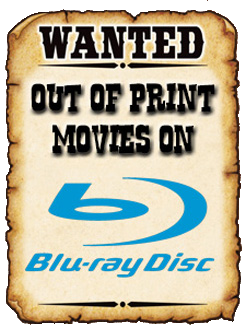 If you shop around, you may get a decent price, but don't be shocked if you see this disc going for thirty dollars or more!